Sometimes the best presents are presents from the heart, crafted from the hands. Help your child to make a Christmas wreath this silly season to welcome all your friends and family to your holiday celebrations! Glue, HINT: We have a recipe for this! Take the paper plate and cut out the inner circle to create the wreath base. Tear the tissue paper into small pieces and scrunch into small balls. 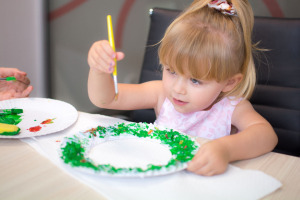 Paint the paper plate section with glue and place the scrunched tissue paper onto the plate. Cover one entire side of the plate and allow to dry. Once the glue has dried you can now paint the wreath! After the paint has dried you can hang your wreath. It’s beginning to feel a lot like Christmas!